NASA's Hubble Space Telescope has made the deepest image of the universe ever taken in near-infrared light. The faintest and reddest objects in the image are galaxies that formed 600 million years after the Big Bang. 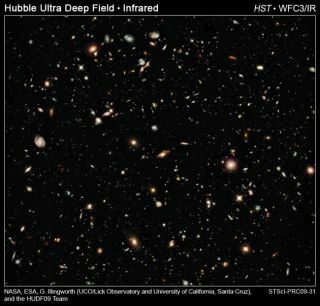 The image was taken by the new Wide Field Camera 3 in the same region as the Hubble Ultra Deep Field (HUDF), which was taken in 2004 and is the deepest visible-light image of the universe. The revamped Hubble Space Telescope has spied what might bethe oldest, most distant galaxies yet seen, astronomers announced today. The faintest and reddest objects in the new Hubble imagesare galaxies that formed 600 million years after the theoretical Big Bang,which occurred about 13.7 billion years ago. So these objects are located about13.1 billion light-years from Earth. Observations of early galaxies can help astronomers learnwhat conditions were like in the universe's early years. Two teams of astronomers from the United Kingdom took imagesof galaxies in the early universe with Hubble's brand new Wide Field Camera 3(WFC3), which can take highly sensitive measurements in the infrared. Infrared light is light invisible to the human eye, withwavelengths about twice as long as (and so redder than) visible light. "The expansion of the universe causes the light fromvery distant galaxies to appear redder, so having a new camera on Hubble whichis very sensitive in the infrared means we can identify galaxies at muchgreater distances than was previously possible," said team member StephenWilkins, a postdoctoral researcher in astrophysics at Oxford University. The new images from the Hubble Space Telescope (HST), taken inAugust over four days, include the region of sky known as the Hubble Ultra DeepField. "Hubble has now revisited the Ultra Deep Field which wefirst studied five years ago, taking infrared images which are more sensitivethan anything obtained before. We can now look even further back in time,identifying galaxies when the Universe was only 5 percent of its current age ?within 1 billion years of the Big Bang," said team member Daniel Stark, apostdoctoral researcher at the Institute of Astronomy in Cambridge. Another recent survey, conducted with the Subaru Telescopein Hawaii, found 22 of theearliest galaxies to form in the universe, with one confirmed to have anage that puts it just 787 million years after the Big Bang. So far, the mostdistant object yet observed is a gamma-ray burst ? the most violentexplosions in the universe ? located more than 13 billion light-years fromEarth. Astronomers can look forward to seeing such distant, earlygalaxies in even more detail in a few years, the team members noted. Hubblereceived its final overhaul last May, when astronauts made repairs andinstalled the new Wide Field Camera 3 and other new tools. "These new observations from HST are likely to be themost sensitive images Hubble will ever take, but the very distant galaxies wehave now discovered will be studied in detail by Hubble's successor, the JamesWebb Space Telescope, which will be launched in 2014," said Jim Dunlop ofthe University of Edinburgh. The teams presented their findings in a series of papers inthe journal Monthly Notices of the Royal Astronomical Society.